In the second novel in the “engaging” (Booklist) cozy library mystery series, Karen must work to clear her beau’s name after his ex-girlfriend is killed by a falling bookshelf while staying at his inn. The Case of the Killer Case? Ropes, revolvers, daggers, arsenic. . . . They are the classic, go-to murder weapons, from Christie to Clue. But death by bookcase? With one good shove, a crafty killer can keep investigators guessing: did it fall or was it pushed? That’s what sassy Midwestern librarian Karen Nash must determine—and if so, who did the pushing—when an avalanche of books and splintered wood fatally flattens Sally Burroughs, the ex-girlfriend of Karen’s squeeze, London B&B proprietor Caldwell Perkins, who appears the most likely suspect for murder. In the library. With the bookcase. And maybe he has grounds? Just as he and his librarian love are making a go of opening their dream bookstore (that’s bookshop, in British English), Sally pops up years after abandoning him, to demand her share of the B&B’s sale. To Karen’s orderly mind, sorting her jumbled feelings about uprooting her life in Minnesota and taking a chance on Caldwell is much like sorting his four-thousand-three-hundred-and-twenty-four precious volumes: everything has its place. A little research reveals that more than one person may have had Sally issues, and Karen must prove that Caldwell is obsessed with books, not revenge. But will her hunt for a killer turn up too little, too late? Sitting on the floor surrounded by books, I realized I had never been happier in my life. The sun streamed in the open window of Caldwell’s library, which had been a bedroom in his B and B at one time but was now filled with floor-to-ceiling bookcases holding row upon row of amazing books. Not in perfect order. Not in terrifically bad order, but I wanted to organize them to my satisfaction. I’m a librarian, and I know how these things should be handled. Caldwell was running errands, and I was glad to have both some meaningful work to do and time to myself to think over the last few months of my life—how things had changed. Caldwell and I had fallen in love under rather dire circumstances and, for both of us, we needed some time to just be together and see if what we were feeling for each other had legs, as they say. There were inherent problems in our relationship: he lived in London, I lived in Sunshine Valley, Minnesota. The plane trip took a good eight hours if you were lucky and then there was the jet lag. Neither of us was a spring chicken; rather we were in the prime of our forties. My previous boyfriend had dumped me and then died rather tragically. Caldwell had started the B and B with his previous girlfriend, who had later run out on him, leaving him to fend for himself and make breakfast for the guests. But that was quite a few years ago. We were both recovering from these upsetting and unreliable relationships. I hadn’t thought I would retire from my job as a librarian for some years yet, but Caldwell was ready to jump with both feet into running a bookstore (or as he was constantly reminding me in British English, a “bookshop”) here in London. He wanted it to be called Nash and Perkins, our two last names; therefore, he wanted me to be involved in the running of said shop. He felt we would make very good partners. He had hinted at wanting to make us more than simply business partners. I had the same thoughts, but was being cautious. I had come over to London about a week ago to try this new lifestyle on for size. Over the years I had accumulated many weeks of vacation time, having taken them so infrequently. I had asked for two months off to help Caldwell get his life and his books organized and to see if we wanted to take these next steps together. Since Caldwell had been scouting around for the perfect shop, word had gotten out of his intentions and was already stirring up interest in his collection. While he collected a great variety of books, he was specializing in children’s books. One of our guests was a well-known book collector, Bruce W. Hogsworth. Bruce wanted desperately to see Caldwell’s library, but so far Caldwell had put him off—just not ready to let go of any of his books. At the moment, I was trying to decide how to arrange Caldwell’s nonfiction, whether to stick with strict library methodology or to be more loose, more intuitive about what books to put next to each other. For example, Caldwell puts all the books about Canterbury, England, together even if they should be shelved apart because some are about its geography and others are about its history. This can grate on me. By nature, I am not intuitive. I believe everything has its proper place. But along with thinking of making a major change in my life—like moving to England and opening a store and living with a man I love—I was trying to be a little more relaxed about all things. For instance, I was learning to eat dinner later. I was used to eating promptly at six. That’s when Caldwell might start thinking about dinner. We went out to eat more than I was used to. And he often bought books because they were handsome, while I tended to focus on their monetary worth. “Will you be able to sell it?” I asked, knowing that he could get quite attached to certain books. He hadn’t told me what book it was or shown it to me yet. I trusted him. He would reveal it to me when he was ready. I knew it could well be secreted away in the very room I was sitting in, but I wasn’t going to search for it. I was content to let things unfold as they would. I wanted to share this lovely, quiet moment with someone, and so I called Rosie, who worked with me as a librarian and who, even though she was a couple decades younger than me, was my best friend. In Minneapolis, it was early in the afternoon. She would be home unless her new beau, Richard, had taken her out to see an early movie. “Hey,” she said when she answered the phone. “Hey, yourself. How are things in Sunshine Valley?” I was feeling so good I nearly sang this question to the tune of “How Are Things in Glocca Morra?” and I don’t even like the song. “You can tell that over the phone?” I asked. “Well, it feels good to be here,” I admitted. “What movie are you seeing tonight?” I asked. Seeing movies was about all she did with Richard—but they both loved it. Which made me want to sing “A kiss is just a kiss.” “Toodles,” I said. The only fly in the ointment of my utterly perfect moment and heavenly day was the decision I had to make—did it make sense for me to completely give up my life and step so deeply into Caldwell’s? How well did I really know the man? Why did I have to lose so much to gain him? I was trying hard to pay attention to what felt right to me. After Dave’s horrible and untimely death, I had seen a therapist for a few months. At first, when she would ask me how something made me feel, I literally didn’t know what to say. I hardly knew what she meant. Cold and hot I could distinguish, but how I felt emotionally about an event was a real struggle for me to ascertain. I had a few episodes of sobbing and laughing hysterically in the therapist’s office. I guess you call those breakthroughs although at the time they felt more like breakdowns. As I sat in front of a wall of books, trying to decide whether to put so-and-so’s book on British history in the historical books, where it belonged, or in the section on royalty, next to a book on Princess Diana, where it might also find readers, I was also working on simply feeling happy, letting this emotion wash over me in waves. How odd to have to practice feeling happy. Just at the moment when I thought I had nailed it—when happiness flooded over me like a warm and powerful rain shower—the doorbell rang. Little did I know that answering it would completely blow my happy world apart. Mary Lou Kirwin has lived in France, Belgium, England, and New York City. She now lives a quiet life in the wilds of Minnesota and Wisconsin. She feels she owes a great deal to all the librarians in her life—for handing her the right book at the right time. "A charming, low-key sequel...[the couple's] forays around London to find a bookstore space that is not too big and not too small evoke a fairy tale." "Likeable characters and smoothly flowing plot make this a delight to read. Book lovers will like the setting and the plot. Other cozy lovers will, also." 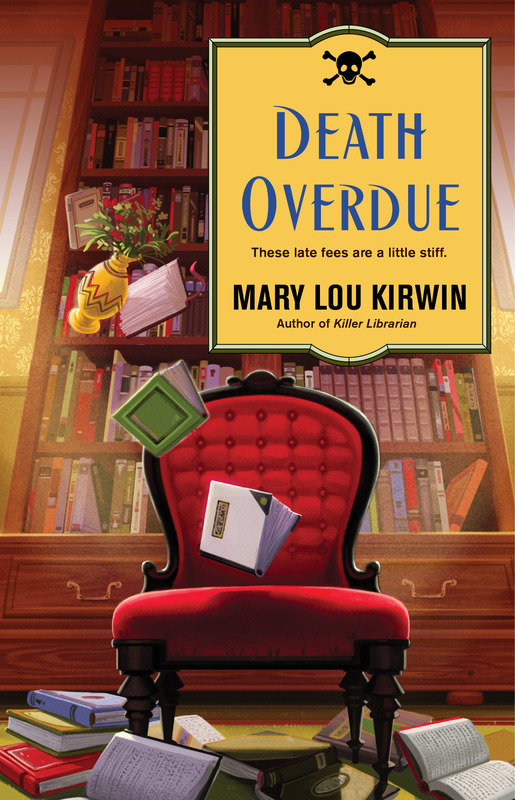 "Talented author Mary Lou Kirwin has created a seductive cozy mystery series with Karen Nash, Librarian-Sleuth. Death Overdue is the second book in this delightful series and is totally entertaining. Familiar characters return with another enigmatic problem to be resolved, keeping readers on their toes until the astonishing ending." "An enjoyable cozy mystery...I look forward to reading the next in the series." "How can you not buy this cozy debut with its catchy title? Kirwin succeeds at creating a winning heroine whose amateur sleuthing efforts make for a fun, gentle puzzler with a touch of love." "This engaging cozy has it all—English bookshops, flower shows, dotty sisters, plenty of surprises—along with an engaging premise for a continuing series." "A charming debut for Mary Lou Kirwin...I hope this author has more books coming, and soon."